In September 2018 up tp the beginning of October, I did simple "deep-sky summer / autumn observations," which might be of interest to other beginners and are therefore described here. They took place in Sumène, Haute Loire, France, and were carried out with my Omegon Photography Scope 72/432 telescope and with my binoculars, that is, with simple means. From mid October to mid November 2018, I repeated some of these observations with my Omegon PS 72/432 telescope and my Sky-Watcher Heritage 100P telescope as well as my binoculars in Mühlhausen/Kraichgau, but did not observe any new objects; I add these observations to this page. 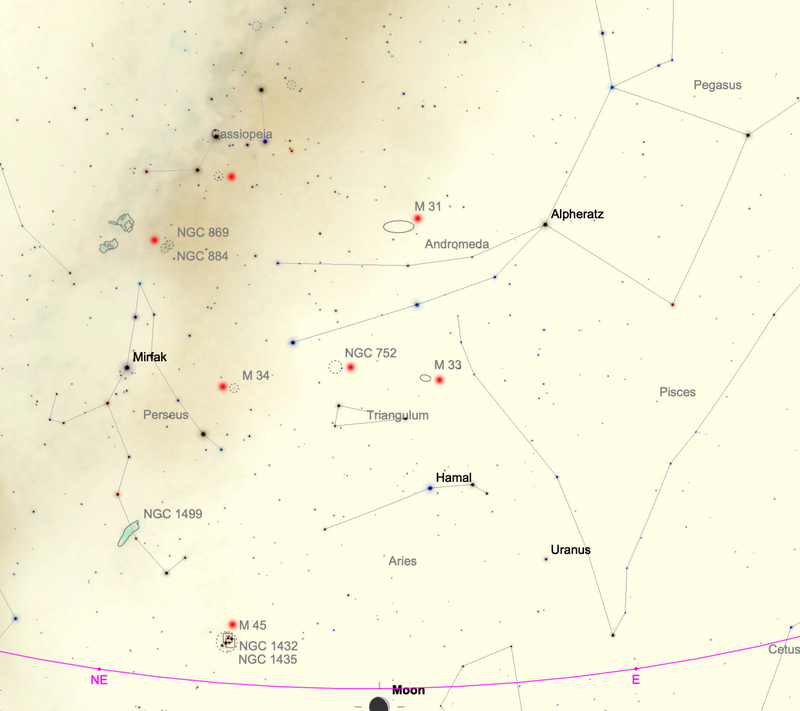 I confined my observations to the sky area in the south with Hercules, Cygnus, Lyra on the one hand, and to the area between Andromeda, Cassiopeia, and Perseus on the other hand, as well as Pegasus/Aquarius in between, and Ursa Major in the North. The observations were done in September/October 2018 and from mid-October to mid-November 2018. In the first serien in France, I used my Leica Trinovid 10 x 25 BC binoculars (LT binoculars), my TS 10 x 60 binoculars, my Omegon 2.1 wide field binoculars (OM21), and my Omegon PS 72/432 refractor. With the latter, I used my UWA eyepieces (16 mm, 7 mm, 4 mm) and a 24 mm Televue eyepiece for a maximum overview. During the second series in Mühlhausen, I also used my Sky-Watcher Heritage 100P telescope, my Sky-Watcher Skymax-127 OTA, and also my Omegon 76/300. So this time I observed "manually" without any GoTo control! The sky above Sumène, Haute Loire (France) is relatively dark (the Betz observatory used by the Orion43 group is near-by). The milky way could be seen very well at times. In general, the sky above Mühlhausen/Kraichgau is "light-polluted" and does not invite you to search for deep sky objects. OC: M 103, NGC 663, M 52, NGC 457, St 2 (Muscle Man), Mel 20, NGC 884/869, M 45, M 11, M 17/NGC 6618 (Omega Nebula), M 16/IC 4703 (Eagle Nebula) Cassiopeia: M 103 (3-4 stars), NGC 663, M 52 (seen better this time), NGC 457 (ET), St 2 (Muscle Man); not found: NGC 654, 559? Oct 13, 2018 GC: M 13 Hercules: M 13at various magnifications PS 72/432 ??? Vulpecula: Cr 399 (coat hanger) PS 72/432, LT and TS binoculars ??? Vulpecula: Cr 399 Coat Hanger (TS) Heritage 100P, TS binoculars ??? Andromeda: M 31 (100P, LT) Heritage 100P, LT binoculars ??? 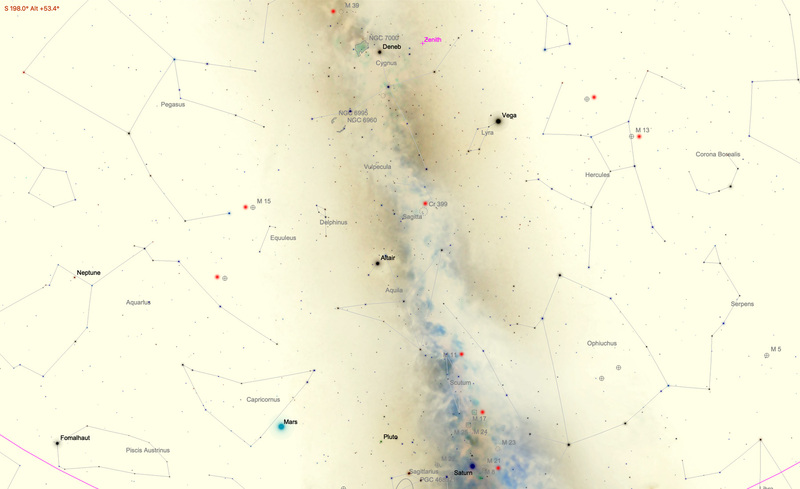 All the star maps were created with SkySafari Pro for Apple Macintosh.